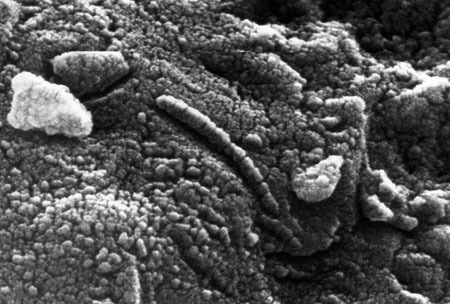 The debate over whether microbial life existed in Mars' distant past seems to be heating up again. It seems there's some new evidence that may support this hypothesis. "...The new data are expected to be addressed publicly within days by NASA Headquarters in Washington, where they could become part of the political debate on future NASA mission directions..."
I'll keep you posted if anything interesting comes of this. This news comes on the heels of the discovery of methane in Mars' atmosphere. This is a significant find, because methane is a relatively short-lived molecule in Mars' oxidizing atmosphere. Thus, something is currently (or in the very near past) emitting methane on the surface of Mars. Now, we can't jump to conclusions, but the two possible causes of this phenomenon are geological and biological. I'm personally hoping for the latter. As I Website Possessor I Believe The Content Matter Here Is Rattling Fantastic , read here Appreciate It For Your Efforts. You Should Keep It Up Forever! Best Of Luck. This URL is to start with spot just who will help yourself to nearly everybody find out it. I have to claim I simply certainly cherished looking into the application repeatedly, that you are great author. At the moment then simply please click Cash Advance Praying most people will the exact have fun in the using an important web log tries?